Remember those so-called true stories you shared at camp, sleepovers, or around a fire? The man with the hook. The strange noise a parking couple hears outside the car. The guy who wakes up in a bathtub of ice without a kidney. Urban legends that never seem to die. Harmless stories meant to teach a lesson. Just like the supply of urban legends, there are countless business myths. You haven’t even heard all of them, much less need to worry about them. Today we’ll focus on the Top 3 Small Biz Myths That Will Torpedo Your Profit. Let’s listen in to a conversation I’ve had countless times with entrepreneurs. This myth isn’t limited to small businesses. I’ve seen it in Fortune 100 companies – they call it “economies of scale”. 9 times out of 10 they never achieve these mythical economies of scale. If you don’t have a concrete plan and reason why you stop losing money as you sell more, then you will simply lose more money. Ever wonder what happened to Groupon? They used to be the big thing. Want to run a special? Use Groupon! Want to attract new customers? Use Groupon! Want to achieve world peace? Use Groupon! Ok that last one is in jest, mostly. It seemed as though any problem your business had, Groupon could solve it. Let’s take a look at the model behind Groupon – using loss leaders to attract new clients. A loss leader is selling a product or service at a major discount, in other words a loss, to attract new customers. The idea is that this great deal will pull them in, giving you a chance to knock their socks off. Once they’re hooked they’ll buy more from you at regular (profitable!) prices. You’re awesome right? How could they resist? A few of your regular customers buy the special. Why wouldn’t they? They already know you’re great. Those new customers? The ones you were going wow and turn into repeat customers? They’ve moved on to the next deal. They weren’t attracted to you for your quality service, unique approach, or amazing speed. They saw the price. Once the price deal was gone, they were gone. Unless you’re the Walmart of your industry, this approach will not attract your right people. This is exactly what small businesses discovered on Groupon, which is why it’s no longer billed as the go to, one size fits all, solution for small businesses. Small Biz Myth #3: Freebies are a MUST to make customers happy. Think about the last time you bought a car. Did they give you a free upgrade to heated seats (a must here in Minnesota)? Were custom rims thrown in gratis? Did they install an entertainment system on their own dime? Nope. Are you an unhappy because of it? Do you refuse to do business with them again? I doubt it. When you go to the dentist do you ask to have an extra cavity filled at no charge? The dentist is in there anyway right? It should only be another 10 minutes. Why can’t they just do it, and make you happy? Not only have I never gotten a cavity filled for free by a dentist, if I did I would probably be worried why. Is it part of a conspiracy to hide secret files? Did my business rival ask them to inject slow release arsenic in there? Perhaps it’s some new take on Total Recall. We all know dentists don’t just throw in extra services to keep their patients happy. You don’t need to give away freebies to make customers happy. Why do you do it then? I find it boils down to mindset. Having the right mindset is crucial to being profitable and prosperous. That’s why I created Daily Money Mindset Boosters. Think you might need this? Head over now and try it free for a week. Update: After posting I realized how totally hypocritical this link appears, so let me explain. No time? Let me summarize. Giving someone a free trial is a legitimate marketing technique. Like when Baskin Robbins offer you that taste on a small pink spoon. It awakens the appetite and now you want more. You don’t get another free sample, you have to buy a cone. My offer is not free forever. It’s a sample. If you like it, then you can subscribe. What are common business myths you see people believe, and have their bottom line suffer? What have you experienced? What challenges are you facing now? And if you ARE the person who lost a kidney (not their first cousin, college roommate, or best friend’s sisters dog’s owner), sounds off below. This post is part of a monthly word carnival hosted by small business experts. 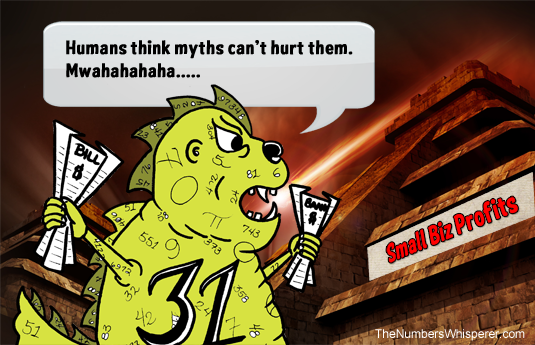 This month’s topic: Business Urban Legends Every industry needs a good bit of mythbusting. This month, we’re tackling the myths and misunderstandings of our particular fields. One of the biggest myths new biz owners believe is the “I should offer a coupon/discount” promotion if I want to get new customers. (They might not know enough to call them a loss leader.) I always say, the discount can hurt your positioning in the mind of your Right People. It trains them to look for the sale, versus buying when they need to. So I often advise folks to use a freebie (no/low cost) as a bonus for enrolling/buying early instead. But whatever tactic folks decide to use, they need to factor in the full cost of whatever that might be to the price (and profit) of the product or service they’re selling. It’s the only smart way to do biz. Freebies, anyone? So much of what you read and hear online is advice about why it’s so friggin’ important to create an “irresistible freebie” for lead generation and to grow your email list. Really?? A long time ago I offered a killer freebie and guess what happened, Nicole? People downloaded it, enjoyed it, praised me for it, and all the while, they were my WRONG people. They were just folks looking for yet another freebie. Pffft!! Great roundup of myths, Nicole. I find your response to #3 particularly liberating, especially when so many people insist that a freebie is the only way to go. Oh my heavens, yes. I haven’t come across the volume thing with clients but definitely the latter two. Groupon (and it’s Living Social cousin) are the devil. When they were all the rage I had a bunch of people trying them out and one story was worse than the next. First of all, you are absolutely right that those deals are only for deal shoppers. I mean, it’s what I would do…. get a super discount, take advantage of it then move on. You would have to do something SUPER impressive to keep a customer after that. Another unintended side effect was volume. Businesses couldn’t keep up with the sudden demand, which turned into a customer service fail, which REALLY didn’t win them any love. So yeah, I am all about not price slashing or “deals”. Freebies, yeah. That is another myth sold, I think, by “online marketers”. Give free things and they will come. Funny but even before I read your correction at the end I got the point you were making about a free TRIAL vs “free”. Because at the end of the day if there is value attached to something, there has to be a price tag attached, too. Otherwise go live on a mountain and run a charity. Really good points here and I also think this ties in with the mythology of pricing (you know, how something is worth 8 billion dollars but you can have it for $9.99 – or even free). Why do people propagate such stupid ideas! Offer value. Get value in return. Simple. Wonderful advice as per usual, Nicole! (And a funny side note…I had a good friend who worked at Groupon before they tanked, and you are 100% right about why they weren’t successful in the long run). I agree that free samples aren’t necessary, but free content (a.k.a. value) can bring in lots of profit. If customers see the value in your free blog posts, emails, white papers, etc., they trust you, and when they trust you, they’re likely to buy from you. Nicole, I love the way you write. I was so a fly on the wall in that conversation. Denial, we are so expert at it as small business owners. Of course, if we sell volume, we must make a fortune! I have heard that so often and it is peddled online all the time by those who benefit by selling volume models. Notice they never refer to the quality of the product, or if it is targeted at people who actually want it. I think we give away stuff for free in our blogs all the time and that is perfectly acceptable and indeed desirable so that people have a sense of who we are and what we offer. The low risk entry point product is the key I believe to building solid relationships with people who really want what you offer. Everyone else might benefit from the offer but not find you are the right fit or the price point is too high for them. If you structure it right, it is a win for everyone. You serve people well, doesn’t cost you too much or take too much time and some will like what you offer enough to want to more. I offer a free initial consultation, but that’s it. Even so, I’m considering moving to a paid consult, like attorneys and others in my industry are doing. As it is, the only freebie I offer is a copy of my e-book IF they sign a contract and hire me.